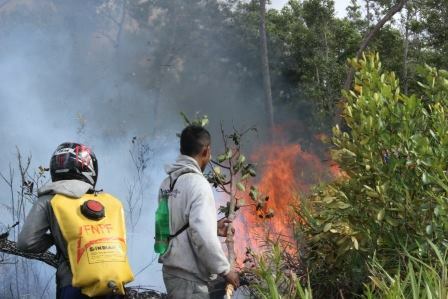 The haze caused by forest and peat-swamp fires in Sumatera and Kalimantan has become a major international issue between the governments of Indonesia, and neighbours Singapore and Malaysia. The choking haze, which shuts schools and work-places, and threatens the health of people in affected areas, has become an annual event. 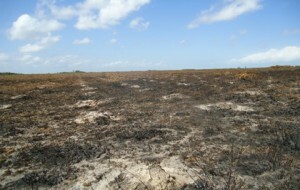 Environmentalists claim that most of the fires are started deliberately, as a quick and apparently inexpensive way of clearing land for plantations and fields. Controlling these slash-and-burn fires is difficult, however, and some smoulder for months, particularly in areas where peat and coal are present. The greenhouse gasses released in these fires, which cover an enormous area, are the reason Indonesia is one of the world’s top six emitters of GHG’s. Forest fire near our site. Quite apart from the haze issue, the burning of scrub and forest has other serious impacts. One of them is the destruction of replanted forest areas in Sumatera and Kalimantan, carried out by dedicated conservation organisations like Friends of the National Parks Foundation (FNPF). For several years now, FNPF has been conducting reforestation at a number of sites around the Tanjung Puting National Park in south-west Central Kalimantan. The work is funded by generous international donors, and is supported by local NGO’s and the local community in that area. One of these sites is Lamandau River Wildlife Reserve, Central Kalimantan on the island of Borneo, where what was once a green tropical paradise, vibrant with plant-life, animals, insects and birds, has become a desert of scrub. This was the result of clear-cutting by loggers. Years worth of hard work destroyed in a week. Under Indonesian law, the loggers are required to replant the trees that they have cut, but this is easily circumvented, often by closing the original company, and starting anew somewhere else in the forests. Based on the success of FNPF (Friends of the National Parks Foundation) reforestation projects in other parts of Central Kalimantan, FNPF were invited by the Central Borneo Biodiversity Conservation Unit, who manage Lamandau River Reserve, to open a reforestation centre in Lamandau, to start the process of re-greening the logged areas. Between 2012 and 2015, more than thirty-five thousand saplings have been planted on thirty-two kilometers of corridors in Lamandau, by FNPF staff and volunteers, and also local people. FNPF believes strongly in the importance of involving local communities in the re-greening efforts, as they are the ones who benefit from reforestation, but also suffer when forests are destroyed. The collection and husbandry of saplings for planting is also a source of income for local people. 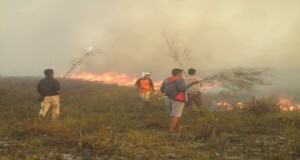 Now 90% of the replanted forest areas in Lamandau have been destroyed by forest fires, which have been made worse by an unusually long dry season. One specific issue in Lamandau is local traditional hunting methods which can involve setting fires to herd deer, pigs and other wildlife into forest clearings where they can be captured and killed more easily. FNPF have worked closely with local communities to socialise the importance of not burning the forest, and protecting existing and replanted forests. This is in addition to fire patrols in an area of more than 200 Ha along with the local people each dry season which is when the fires usually occur. 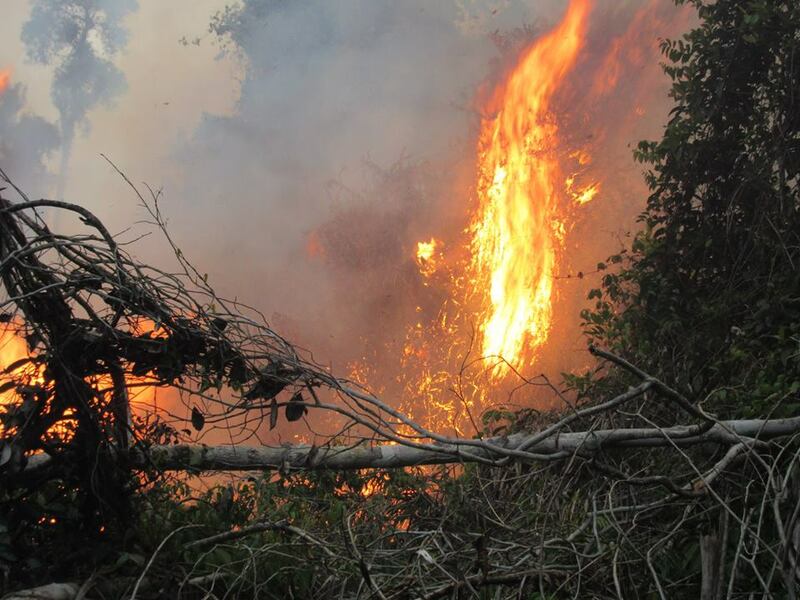 In previous years FNPF have managed to control the fires, and the impact of the fires has not caused significant problems for the reforestation sites, and the remaining forest. The fire continue to burn all night. 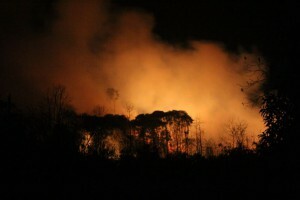 Fires have also destroyed substantial tracts of forest nearer the Tanjung Puting National Park, where FNPF has also been active in replanting. Our staff tried to put down the fire with every resources they have. Once a growing forest corridor was turned into a barren waste land.